As long as I can remember, I have always been interested in eating. Learning to cook, starting at a very early age, seemed to me, to be a good strategy for getting more of what I was interested in eating when I was growing up. Our mother, Dede, was never that interested in cooking, and still isn't. 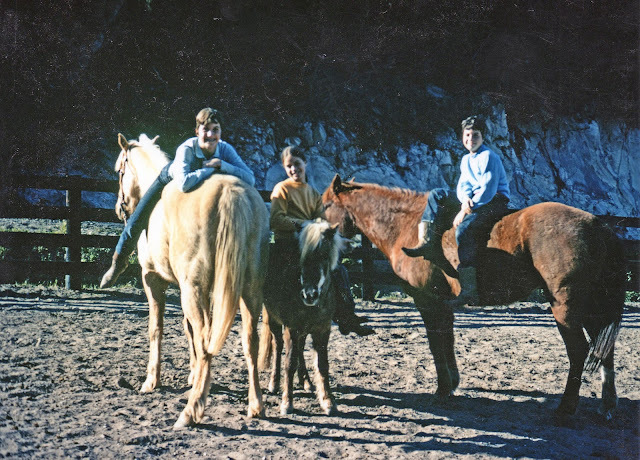 Sorry, Mom, but we can acknowledge after the passing of all of these years, that you regularly made items that my sisters and I found pretty unpalatable. It was the sixties, and to be fair to Mom, most of America was way behind in the culinary revolution that would follow, so our mother can hardly be blamed for serving up meals that included such items as red Jell-O and Del Monte canned fruit cocktail as "the fruit salad", with Van de Kamp's fish sticks as "the entree" for dinner. I cajoled Mom in to letting me begin with making things like pudding and cookies when I was about 10. I remember Mom supervising my early cooking adventures, and it seemed to me at the time, that her main concern was, of course, to some degree, my physical safety. Moreover, a primary interest of hers was that I make the least amount of mess to clean up as possible. Mom will be the first to admit, that her dislike of making a mess in the kitchen has kept her from really enjoying cooking all these years. Not so for me, Juliette or Michelle. We love a good mess, because we know the mess in the end, leads to some very fine meals. 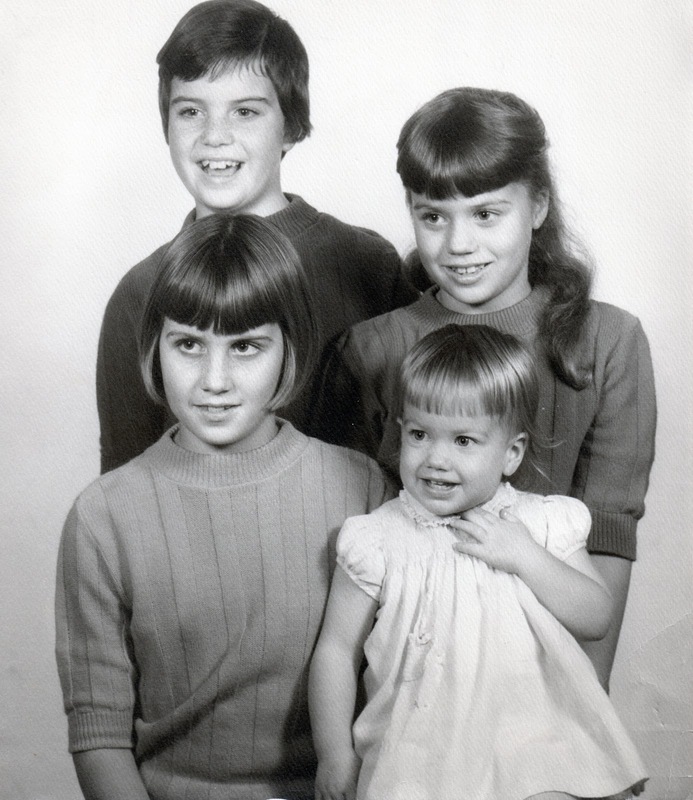 I recall that I cooked my first complete dinner for the family in 7th grade. It was memorable for me in large part because I worked all afternoon on my menu selection from Irma Rombauer's "The Joy Of Cooking", only to have my Dad comment after we ate the contents on the plate, that what I had served was a great appetizer, and he asked with a malicious gleam in his eye, "Where is the dinner?" Much weeping erupted from his sensitive daughter, but fortunately because of my love of eating, I persevered on. By the time I was in high school I had become fairly proficient in the kitchen. This leads me to how this all of this family history relates to apple pie. 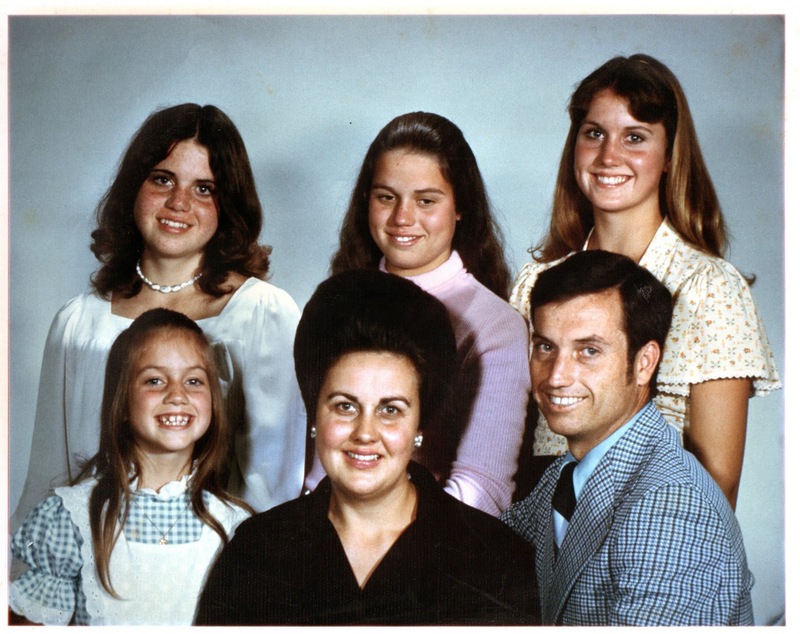 Hands down our worst family portrait - circa 1973 - always makes me laugh. My aforementioned father, Paul, has always been a pie person. He really isn't fond of cake. He will join in for a slice of my favorite cake, German Chocolate, always requested by me on my birthday. And just like Johnny Depp's character in the movie Chocolat, he will respond something like, "I'm undone, but it's not my favorite." On Dad's birthday—he wants pie. And no one loves Thanksgiving more than Dad. He is in pie heaven on that day. So I began my quest to make the perfect fruit pies in my teens since those were Dad's favorites. Dad was really ecstatic if the pie was made from fruit that grew ourselves on the five acre farm where we lived in the seventies. If the pie was baked from our apricots, boysenberries or apples, he would pronounce in a pie-induced euphoria, that a particular pie was indeed the best pie he had ever eaten. Linda, Maria and Juliette on our horses on our Central California farm. Recently an old friend wrote to me, and asked for the recipe. Megan and I worked together at The Ballard Inn in the late 1980s. The Ballard Inn and Restaurant is a beautiful Bed and Breakfast Inn situated in the acclaimed Santa Ynez Valley in California. Megan's mother, Beth was the manager of the Inn when I worked there, and Megan lived across the street with her daughter Raiza in a cute little house that was painted barn red. Megan helped out working at the inn part-time, and she was a big fan of the creations that I made for breakfast and high tea for the guests at the inn. Raiza must have been about five or six at that time, a beautiful little girl with huge brown eyes like her mother, and possessed of a sunny nature. Megan's recent message to me related that Raiza is getting married soon (goodness me... time does fly by! 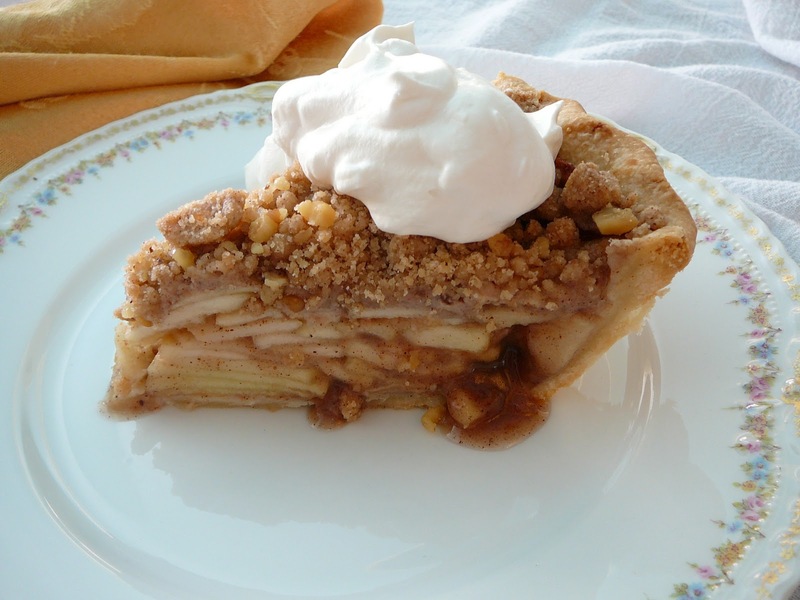 ), and that instead of the traditional wedding cake, Raiza would like to serve to her guests—you guessed it—apple pie. Turns out, Raiza is a pie person, too, just like my Dad. Linda with the late Tom Bradley who was the Mayor of Los Angeles for five terms. 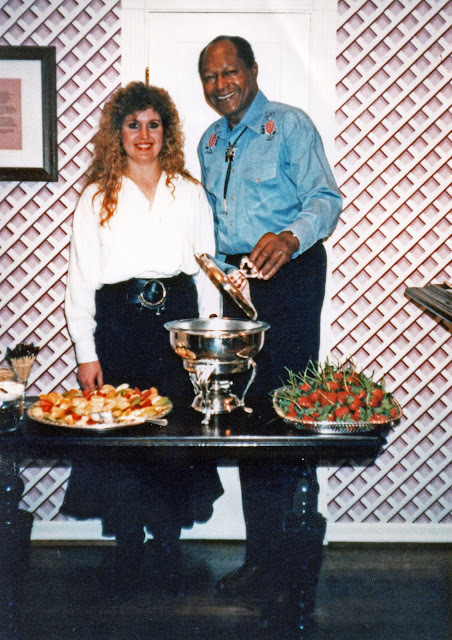 She prepared food for a campaign fundraiser at The Ballard Inn circa 1987. In the 90s, when I baked at The Los Olivos Grand Hotel which is now The Fess Parker Wine Country Inn and Spa, it was the first time that I was in charge of creating the daily dessert tray that was presented to the diners at the end of every lunch and dinner meal. Since I was baking all of the bread for the restaurant in addition to creating the dessert menu—yes, that's right—every last muffin, dinner roll, slice of bread, hamburger bun and cookie all were produced by yours truly, I needed to use every minute on the job to the fullest. Often, I had special occasion cakes to produce for birthday parties and weddings, as well. So I learned quickly that the desserts that I chose needed to have a little longer shelf life, because I simply did not have the time to bake and fill the entire dessert tray everyday. My New York-Style Cheesecake is a great example of this type of dessert, because it gets better after sitting in the refrigerator for a day or two. 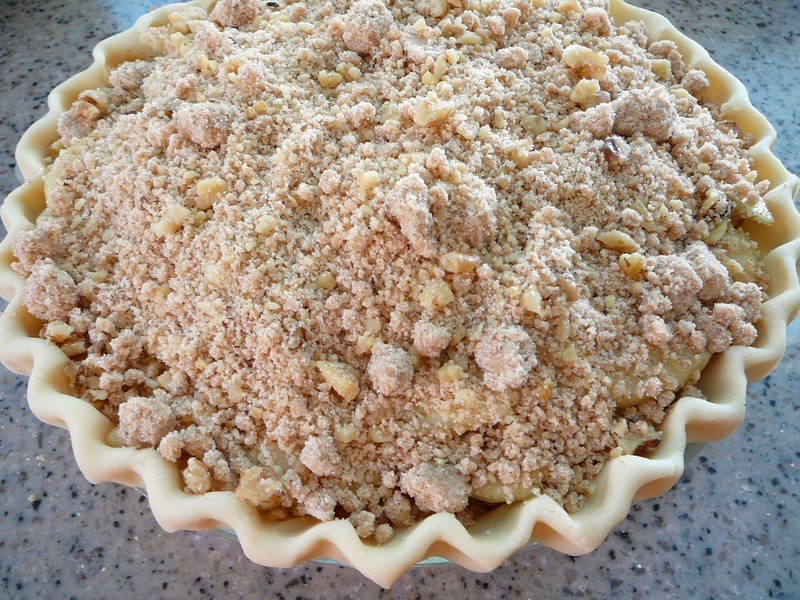 Since apple pie was such a crowd pleaser and always in demand, I learned that the pie held up much better for three or four days if I put a crumble topping on it instead of a regular pie crust. In my quest to make the perfect apple pie, I developed a recipe that cooked the cornstarch and spices in a liquid "broth" before pouring over the apple slices and baking. This made sense to me, because thickeners need to be cooked (the same reasoning behind making a roux for gravy), so that they lose their "floury" taste, and cooking develops the flavor of spices. Another trick that I used for large scale production but still allowed the production of an excellent pie, was slicing the apples ahead of time, and then storing the slices in pineapple juice. This was a trick that I learned from my Mom and Dad on the farm. During apple season when we were innundated by apples, they used to peel and slice the apples on an antique apple peeler, and then dip them in pineapple juice before dehydrating. This as it turns out, is a natural and very effective way of keeping the apples from browning, and not nearly as tart as lemon juice. At the hotel, my pastry helper, whose sole function was to produce countless sheet pans of three ounce dinner rolls from the dough that I made, and to keep giant lexans full with sliced apples soaking in pineapple juice, so that I was able to produce eight or more pies at a time on a moment's notice. The recipe's instructions contain both the tips and tricks that work well for baking a perfect pie. You may want to read all the steps before you get started. This is the perfect dessert that is best baked a day in advance and let it sit at room temperature until ready to serve. 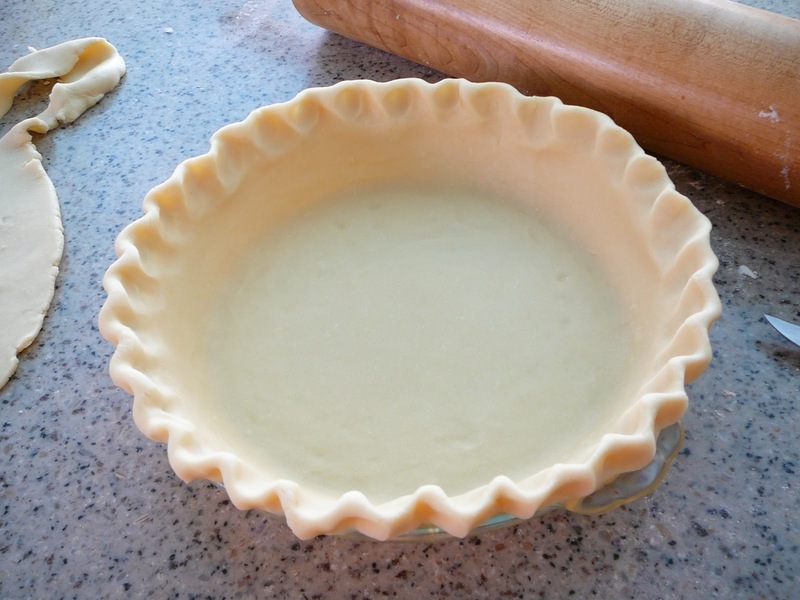 You can make pie crusts ahead and freeze them up to 6 months. Simply process one recipe at a time in the food processor - no need to clean the bowl between batches. It is a real time saver to have pie crusts made ahead and flattened into 7 inch circles that are wrapped first in plastic wrap and then in foil. Use a Sharpie to write the date on the foil. Restaurant supply stores sell plastic containers called Cambros that we use (you can also purchase them on-line) or use a large container or bowl covered with plastic wrap or a lid. Cambros are great for storing, soups, salads and even sourdough starter. They also stack, are not expensive and have measurement guides on the sides which is helpful. For an autumn themed dessert buffet, the apple pie pairs beautifully with our family's Pumpkin Pie and Pecan Tassies. 1. 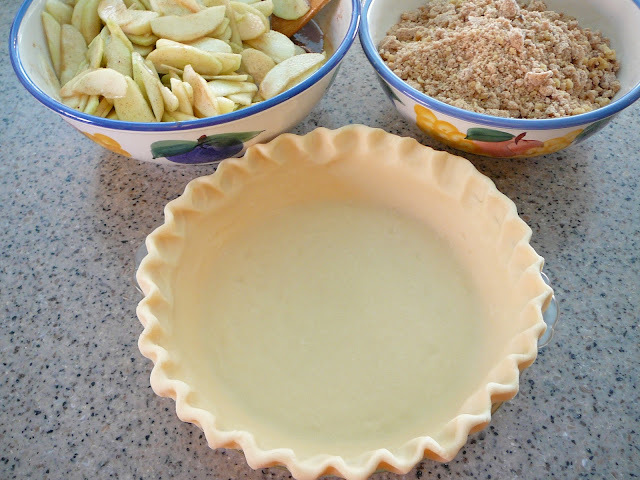 Prepare All Butter Pie Crust, according to recipe. Place into a deep-dish 9-inch or 10-inch pie plate, crimp edges, and refrigerate (covered lightly with Saran Wrap) until ready to use. This can be done the night before if you plan on baking in the morning. 2. For the apples: In a Cambro or deep bowl, pour in the pineapple juice. 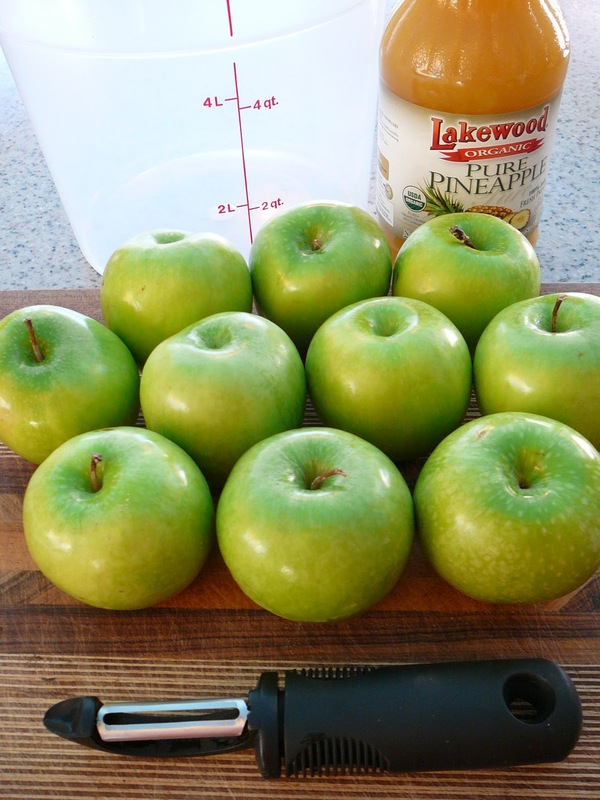 Peel, core and thinly slice (1/8-inch) each apple, adding the sliced apples to the pineapple as you work. (Slicing the apples on the thinner side allows them to cook through.) 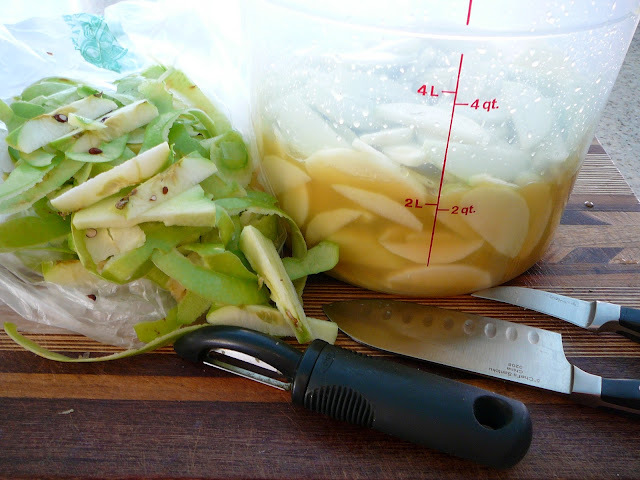 Every once in a while, give the apples a stir so each slice is bathed completely in the juice to prevent browning. When all the apples are prepared (scale as needed for the number of pies you want to bake), cover the container and store in the refrigerator for up to 4 days. 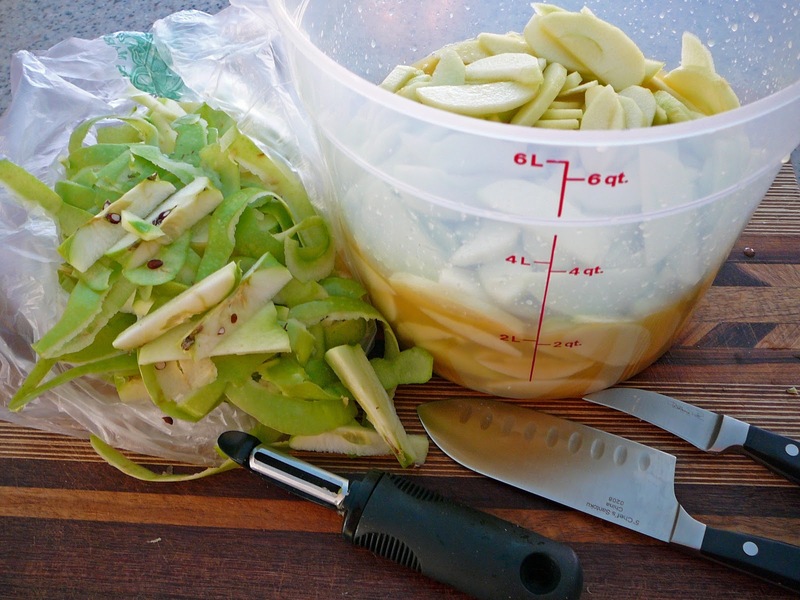 Stir the apples once a day to keep the apples on the top from oxidizing. 3. For the streusel: In the bowl of a food processor fitted with a steel blade, combine the flour, sugar, cinnamon. Pulse to mix. Cut the butter into 6 pieces and add to the bowl. Pulse until the mixture is crumbly. 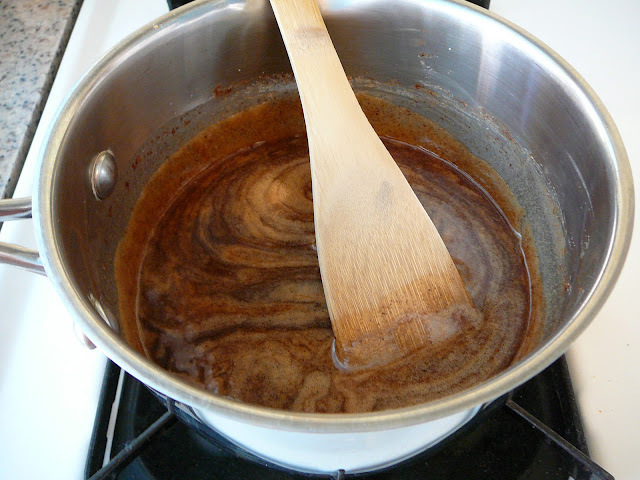 Pour into a bowl and rub it with your fingers until the butter begins to warm and the mixture starts to hold together. 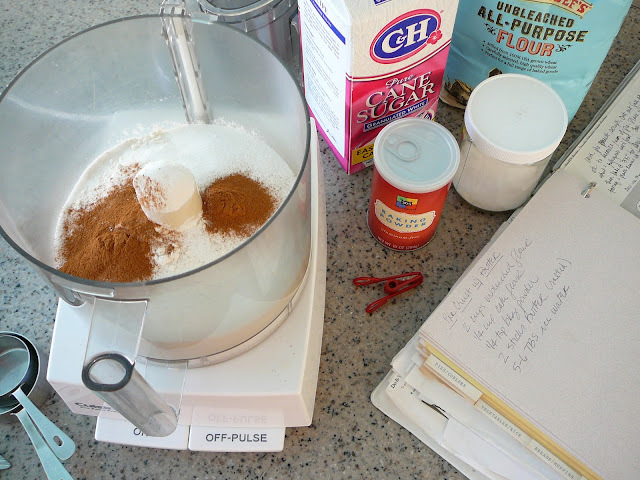 If you are using walnuts, pulse in the food processor until roughly chopped. Add to streusel mix, and stir together. Set aside. The streusel can also be made a day or two in advance; cover and refrigerate until ready to use. 4. To preheat the oven: Arrange two oven racks so one sits in the lower third of the oven and the other in the upper third. Place a cookie sheet on the top rack; it will act as a shield protecting the crust and pie from over browning. Preheat oven to 375°F. I use an empty pie plate as a measurement of the apples that I will need for each pie. Make sure that the pie plate is mounded up, because the apples will cook down. Once measured, transfer the apples once again to the colander and let drain well before putting in a large bowl. 6. For the glaze: Multiply the glaze ingredients by the number of pies you will be making. In a saucepan, mix sugar, cornstarch and spices together. Add warm water and butter. Stir to a boil over low to medium heat. Remove from burner, set aside to cool. Pour the glaze over the drained apples and toss to coat. 7. To assemble the pie: Working quickly so the pastry doesn't become too warm, divide the glazed apples among the prepared pie crusts. Stack the apples high because they condense during baking. I take any remaining liquid left once the apple slices are divided between the pie crusts and divide it equally, drizzling it over the top of each pie. 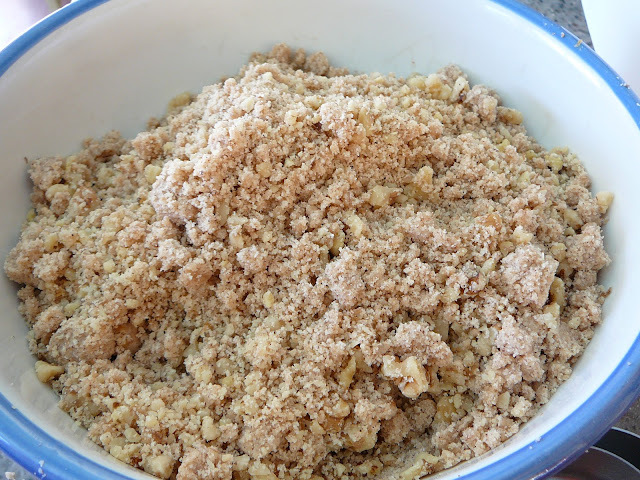 Next, cover the entire surface of the apples with the streusel. With fruit pies I place them on a foil covered cookie sheet in the oven so that the juices bubble over onto the cookie sheet, and not into my oven. Restaurant Supply stores are also a great source for half sheet pans. They are inexpensive, and they do not warp like regular cookie sheets do in a hot oven. 8. Place the pie(s) immediately in the pre-heated oven. Bake at 375°F for about 1 hour and 15 minutes, turning after 40 minutes for even browning. Make sure that your pies bake long enough for you to see that the juices have thickened. The crumb crust will puff up and start to have cracks. Also, use your nose as a guide. I have found after years of baking that my nose is a very good indicator of when a pie if fully baked. Cool the pie(s) on a rack. 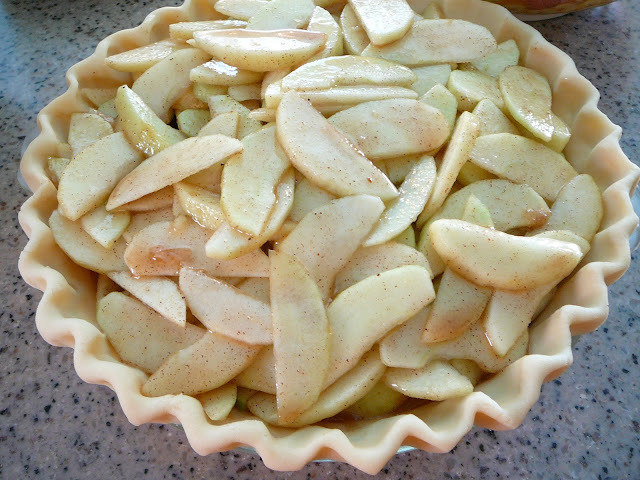 If you wish to bake the apple pie the night before your occasion, there is no need to refrigerate it. Once baked, simply place on a cooling rack until you are ready to serve it the next day. Refrigerate after 24 hours. Oh God, those 50's foods our moms made..you reminded me. Her idea of gourmet was chicken dipped in butter, then rolled in crushed potato chips and baked. Or how about spaghetti made with Cheese Whiz and canned tomatoes? 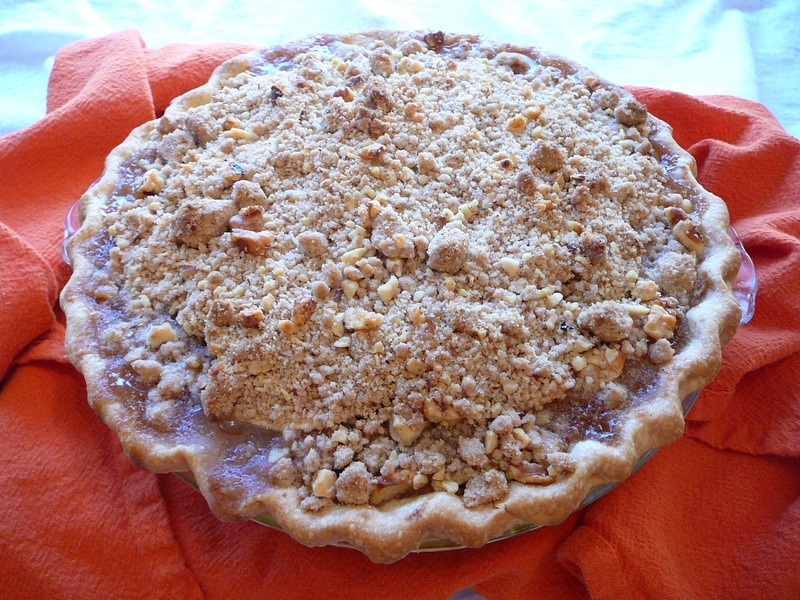 I make a killer sky high apple pie but I love your idea of the "roux" to be poured over. Why didn't I think of that.Thanks again for yet another good blog. LOVE the pics and remember, I grew up in Lompoc, so these are familiar places. The liquid broth you created is called a slurry and pie makers of old used that method in commercial pie baking...and I do, too, at home. Works best so there are no runny juices floating in your finished pie.